Okay, so this isn't REALLY quilt related, but you must admit it's eye catching. You just never know what could be hiding under someone's hair! 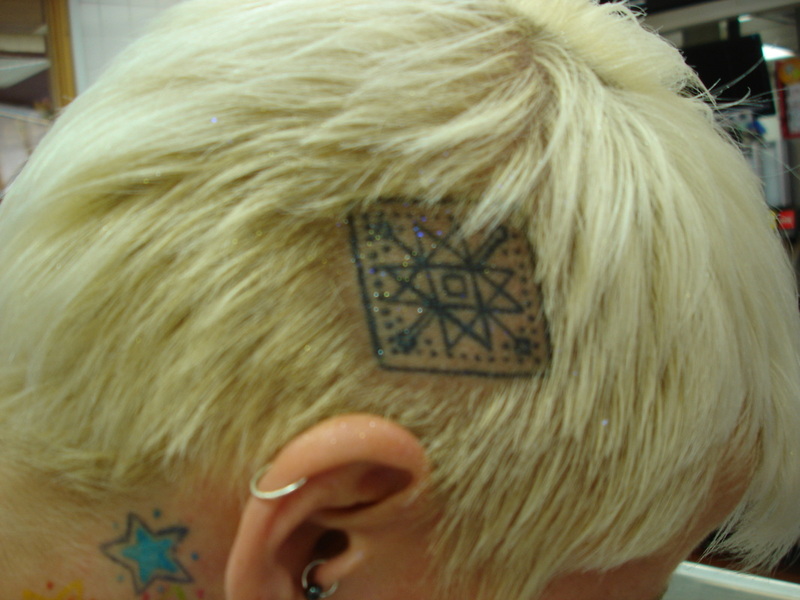 Met a young lady with this on her scalp, and asked if her head tattoo was a quilt? (and if I could take a photo). After agreeing to the photo she told me what the design was called and said it is for good luck? Just catches you by surprise where 'quilt' looking things turn up! My first introduction to Mariner's Compass Stars was through Norma Ewart's class. Assigned as an angel for Norma, I watched as she taught how to draft this star using the 'time honoured method' - starting with a square. It was difficult to draft. 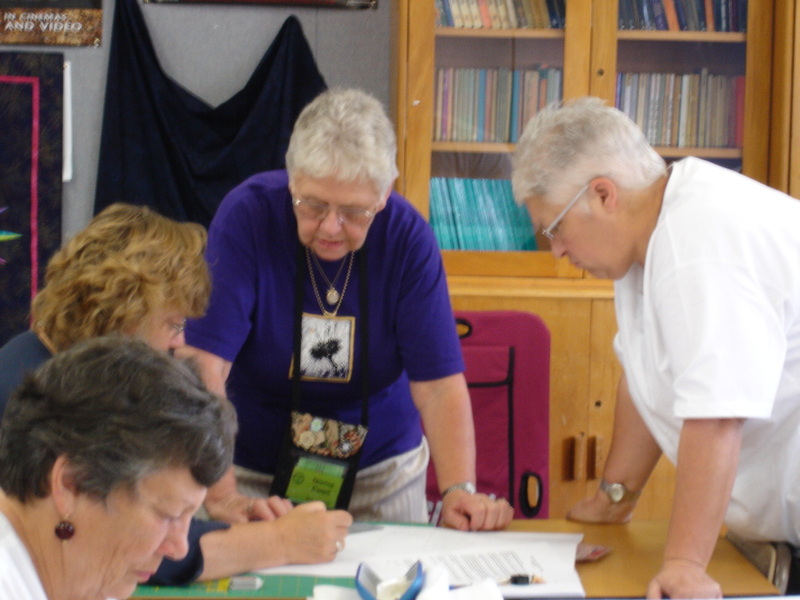 Her students naturally loved this talented teacher, (and award-winning quilter) and they made lovely stars during her class, and I went home thinking. Because this is a circular pattern, my brain rebelled against that square and the difficulty of the drafting. After playing with the pattern for AGES I created an easier way to draft the pattern. This eventuated in my patenting a special ruler called the STARWHIZ. Look for this on my shop page. This is at Houston's 2009- As I demonstrated the STARWHIZ they sold like hotcakes. This was an interesting exercise, and a great deal of fun, but exhausting. The size of this show is staggering, my tiny stall was like a flea on an elephant's back. Unbelievable numbers of people came through. The heartbreak was that though my son and I were there, we didn't have a chance to see the exhibitions or other stalls!! What an experience! For bags we quilters create, this reduces the wear and tear and soiling that naturally happens with everyday use. The fabric feels more stiff and looks a bit plastic. The pattern is available on my shop page. Blue wash away ink is wonderful, however if left in the sun or heated the ink can become permanent. (Never iron blue wash-away ink). This baby sized quilt was my second whole-cloth quilt. The pattern was inspired by a gilded antique book cover, and took a silly lot of time. A few years ago one of my quilt friends passed away quite suddenly. Her bereaved husband had Barbara P. and I go through Ina's quilt gear to see what should be done. Some months previously Ina had come to me with a problem with this quilt, she had run out of a particular fabric and wasn't sure how to finish the project. Ironically I had the exact fabric she needed. Barbara had helped Ina design the corner the pattern as well, so we were both familiar with the project. 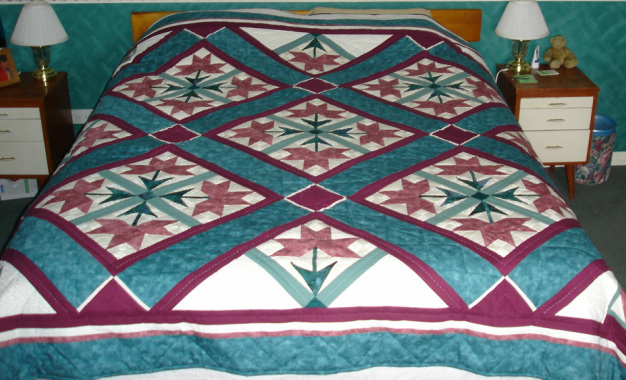 The quilt was partially hand-quilted. After a bit of discussion I took the quilt home and finished the hand work. It was my first and last time to volunteer for such a project. The work meant that I spent more time with Ina's quilt that I had with Ina. It broke my heart. The family was pleased to have the completed quilt, but the emotional toll was pretty heavy. 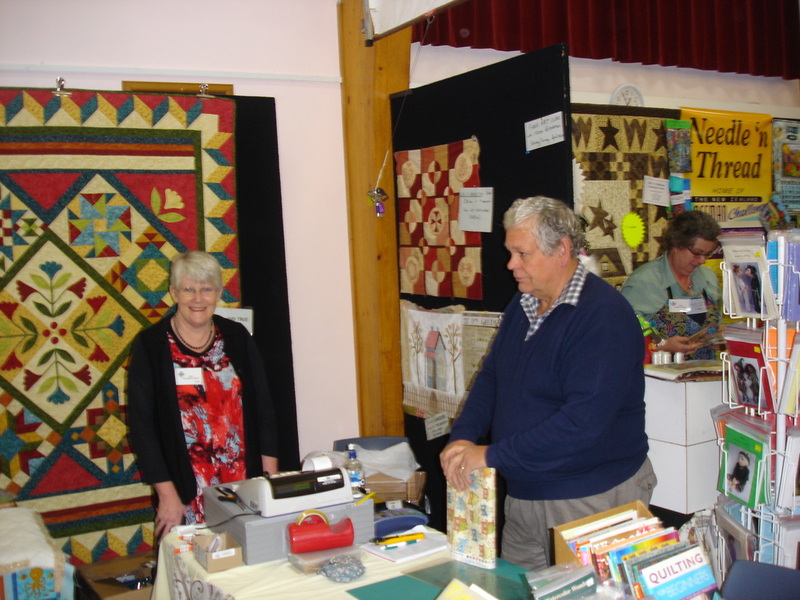 Anne Murchison (along with her husband Tim) owns The Stitching Post in Arrowtown. Anne was the first shop owner to have me in to teach. Brave soul. Ann had a classroom upstairs in the Quilter's Barn (Renwick) where classes laughed and stitched away the hours. As the shop grew the classes were moved downstairs near huge picturesque windows overlooking lovely scenery. 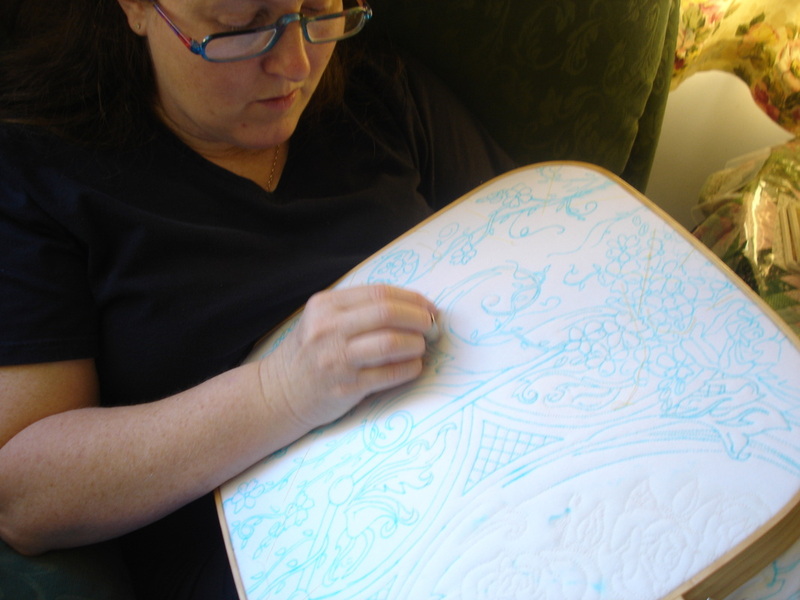 It was an amazing setting for quilting. 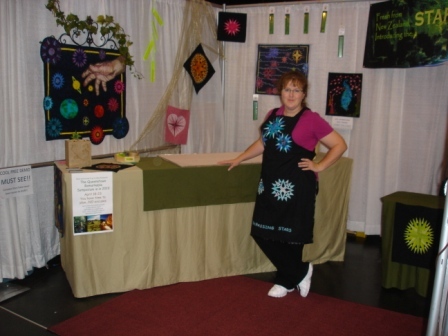 This photo was of her stall at the Queenstown Symposium 2011. 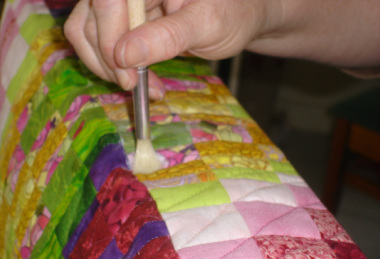 Most 'art' quilters look for new and innovative ways to manipulate fibres. This includes embellishments, painting, felting etc. Somewhere? I found an article about Inktense brand pencils. These are -as the name implies- ink in pencil form, and the colours that can be achieved are unbelievably deep. This test patch was created to check the limitations of these incredible pencils. Some of the ink has had a fabric medium added, some was just applied directly on top of water etc...then after being ironed, all were washed. 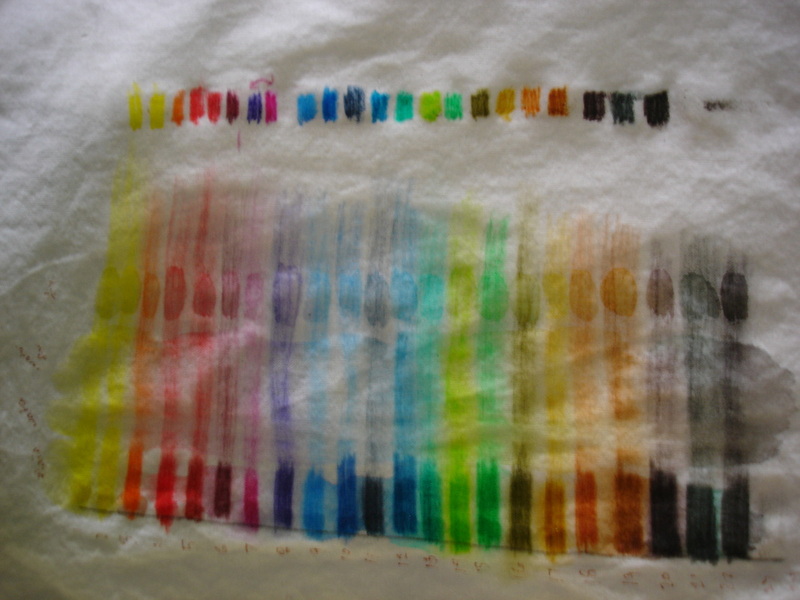 The ink used with the fabric medium had great staying power. If this sort of art supply appeals to you, check out the inspiring collection of dyes, crayons, pens and pencils at Petra's online store- Zigzag- If her selection doesn't inspire you, your inspirer might be broken. Occasionally the artistic streak hits in other ways. 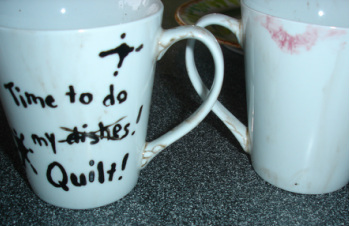 Several of these mug designs have proven popular. 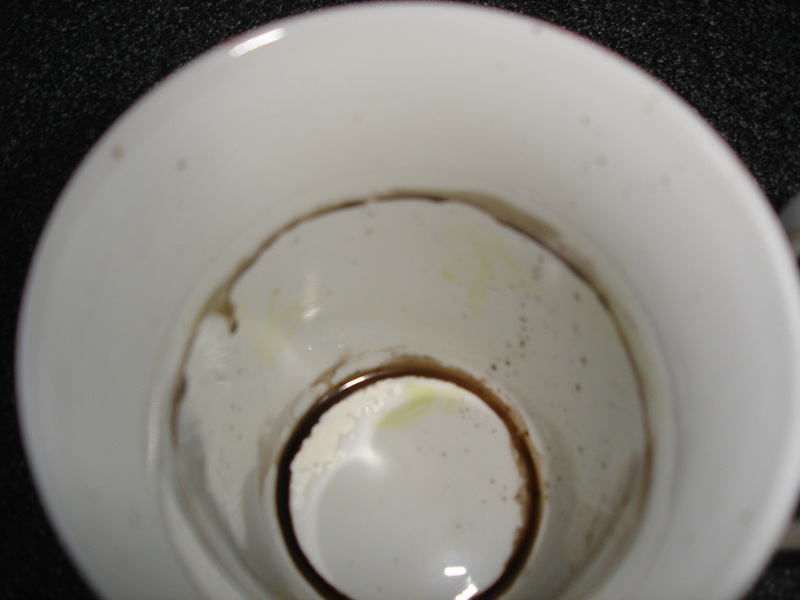 They are painted with a durable baked-in paint. Honestly can't remember what provoked me to start these, but occasionally I'll paint up a few and have them at symposium sales tables. The most popular mug by far is the one in the lower pictures. No it doesn't wash off. (It looks worse in real life.) People either love or hate them. We tripped into Prince Edward Island and found a lovely quilt shop. Lots of selection, some lovely examples of landscape class on the wall. The place had eighteen feet of snow last winter, so one assumes there is a reasonable motive to have a winter craft!!! The whole place is so picturesque. Something other-world tidy about the place.